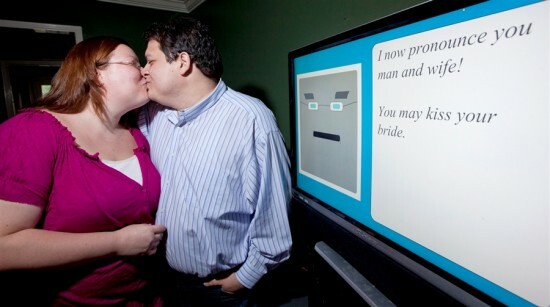 A couple who found each other through an online social network called “Sweet on Geeks”, decided to geek out their wedding by having a computer program called Reverend Bit perform the ceremony. Miguel Hanson and Diana Wesley had one of the most unusual yet appropriate weddings in human history. Hanson, a Houston web developer and IT consultant, got the crazy idea after they couldn’t find a friend to serve as minister at their wedding. He decided he was going to write his own minister, and while she acknowledged it would make them the target of nerd jokes, Diana agreed because it just fit who they are – geeks. They met on Sweet on Geeks, they both love science fiction and fantasy, and since the maid of honor was going to make the bride’s cake with Nerds candy as icing, they agreed to geek out their wedding completely. The unique wedding ceremony took place on Saturday, in Hanson’s house, where the 30 or so guests were greeted by a mechanical, robotic voice. It was Reverend Bit, a program created by Miguel Hanson himself, who treated the audience to a short story about how the couple met, before beginning the actual ceremony. His square animated face appeared on one side of the 30 inch monitor, while the other side showed the text of what he was saying. His voice came over a sound system. While Hanson was the one who wrote the program, the couple worked on the text together, and managed to slip a few jokes in there, too. One of them went like this ”If anyone here has anything to say that might change their minds or has any objections, they do not want to hear it and I will not recognize your objections since Miguel has programmed me to only recognize his commands,”. Rev. Bit performed his duties wonderfully, stopping only when Miguel pressed the pause button via a wireless mouse, to let people speak, and while some members of the family weren’t very open to the idea of a computer minister, it all worked out well in the end. The computer-officiated ceremony wasn’t legally binding, but that’s a small detail the geeky couple intend to take care of with a visit to City Hall. What’s important is they had one of the most original wedding ceremonies ever, one that was all about who they really are.